Established in 1943, the Hockey Hall of Fame is a celebration of the game of hockey - HOCKEY AT ITS BESTTM, from grassroots to the highest level of competition. establish and maintain a museum and official archives for hockey to collect, research, preserve, exhibit and promote objects, images and historical materials connected to the game at all levels. 280 players, 109 builders and 16 on-ice officials have been inducted into Honoured Membership of the Hockey Hall of Fame in recognition of their outstanding contributions to the game of hockey. Today, you have the opportunity to help continue this great heritage by making a donation to support the Hockey Hall of Fame. By doing so, you'll join the greats of the game who have all made contributions to the Hall's growth and development, and together we will preserve the rich history of the game of hockey for the benefit of present and future generations. You can help preserve hockey history and enhance public access to the Hockey Hall of Fame's museum collection! The Hockey Hall of Fame owns a vast collection of artifacts, memorabilia and other historic materials relating to the game of hockey, and like most similar institutions, it is challenged with an ever growing backlog of new and prior acquisitions that require cataloguing documentation and/or conservation treatments (including the digital preservation of archival materials i.e., photographic images, motion video/film, historic documents, etc., for public access and content initiatives). Generally, the availability of funds for these purposes is highly limited and therefore the Hall has determined that, unless otherwise specified by the donor, at least 75% of all individual monetary donations received in the 2016-2020 fiscal years will be allocated to fulfill the mandate of the Hockey Hall of Fame's "D.K. 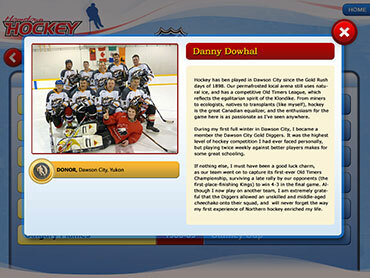 (Doc) Seaman Hockey Resource Centre" with the balance to support sustainable operations. Your gift will not only help the Hockey Hall of Fame preserve objects, images and histories that are significant to the story of hockey but it will also enhance access to the Hall's collections via future on-line and outreach initiatives. Click to enlarge With your donation to the Hockey Hall of Fame, you will have the opportunity to join your hockey heroes in the Hall of Fame via your "personalized donor dedication page" within our new digitally-interactive "Hometown Hockey Zone". This is your chance to share with hockey fans from around the world a personal story or inspiration that made you connect with the sport of hockey. You will receive an official income tax receipt for your gift of $20 or more unless otherwise requested. Issuance of official donation receipts for income tax purposes is subject to applicable laws in Canada or your country of residency outside of Canada, where applicable. Once your donation has been processed, you will receive an email that will provide requirements for your 'personalized donor dedication page'. The Hockey Hall of Fame reports annually to the Canada Revenue Agency (CRA) via the Registered Charity Information Return (T3010). The Hockey Hall of Fame's charitable registration number is 11895-8883-RR0001. The economic viability of the Hockey Hall of Fame depends on the continued generation of income from admissions, retail sales, facility sales/hospitality services, corporate sponsorships, licensing partnerships, archival services, special events (including the annual induction weekend/celebration) and charitable contributions, As a not-for-profit corporation, cumulative surplus funds from operations after debt service obligations (i.e. "internally restricted net assets" per the audited financial statements below) are reinvested in capital assets including improvements to the Hockey Hall of Fame attraction and archive facilities. Consistent with not-for-profit practices, a portion of surplus funds are maintained for internal financing purposes and to protect the operation from cyclical downturns and unforeseen events. Have questions? Call us at 1-888-501-9770 between the hours of 9am to 5pm (ET), Monday through Friday or by email at donations@hhof.com.